Thought I would use the new graphic on those older titles that every once in a while I get around to reading. These are not the new and upcoming books but occasionally I find a gem in my crazy collection some may still be interest in. Thirteen year old fashionista Coco Franks has finally made it into the popular group when her dad decides to move the whole family to the country so they can ‘bond’. Social death is looming, her shoes are covered in mud and all Coco wants to do is get herself back to her city friends. After all, things can’t get any worse, right? It’ll take a boy with no dress sense and totally hick boots, and a contrary horse called Cupcake to bring Coco to her senses. But it might just be too little, too late. Love and Muddy Puddles is humorous realistic fiction aimed at children aged 10-14 and horse lovers everywhere. Set in Australia, this clean teen romance is a funny and inspiring story of how a horse – and a change of perspective and heart – can change a young person’s life. 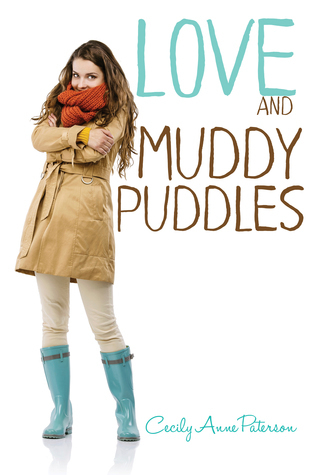 Love and Muddy Puddles is the third novel by Australian writer Cecily Anne Paterson. Her first novel, Invisible, also a clean, realistic story for girls and teenagers, was called an ‘exquisitely written story’ by Publisher’s Weekly reviewer of teenage fiction, and was a semifinalist in the Amazon Breakthrough Novel Awards in 2014. Love and Muddy Puddles by Cecily Anne Paterson is the first book of the Coco and Charlie Franks series. This one is more middle grade than young adult with the characters being thirteen but they certainly bring to mind the old saying of thirteen going on thirty but it’s a cute contemporary read. Coco and Charlie are thirteen year old twins that are actually pretty opposite in nature. Coco cares about nothing more than getting into the popular crowd and has spent years with her best friend planning and plotting on just how they could do so. Just when things go Coco’s way however her father drops a bomb on the girls announcing they’re moving to the country. Coco may be the type of character that some would find annoying but others will find hysterical and entertaining, I happened to be in the latter crowd. Very much self absorbed Coco only cared about herself in the beginning but a bit on the predictable side the story sees her grow and learn throughout. This one turned out to me to be quite a cute read overall with plenty of chuckles along the way. Cecily Anne Paterson is the author of five novels for young teen girls, as well as an award-winning memoir for adults. Her first novel Invisible, was a semifinalist in the Amazon Breakthrough Novel Awards in 2014, and ‘Charlie Franks is A-OK’ won the CALEB Award in 2017. Cecily writes what she likes to call ‘brave-hearted fiction’, hitting some serious issues, but in an age-appropriate, clean, and helpful way, and always with a hopeful ending. Cecily grew up in Pakistan, where she went to boarding school in the Himalayan mountains, and now lives in a tiny town in Australia with her husband, four children and a cuddly dog.